Windows Live Writer is the unsurpassed blogging editor for its effective WYSIWYG (what-you-see-is-what-you-get) editing environment. Great strides have been made by the blogging service providers in creating themes, designs or templates with headers and backgrounds. Some of these features confuse Live Writer and do not appear in the editor as they look in the finished blog. This may be just a bother, but with some designs these features can obscure the typing in Live Writer. The WordPress theme and custom header used with this blog is a good example. 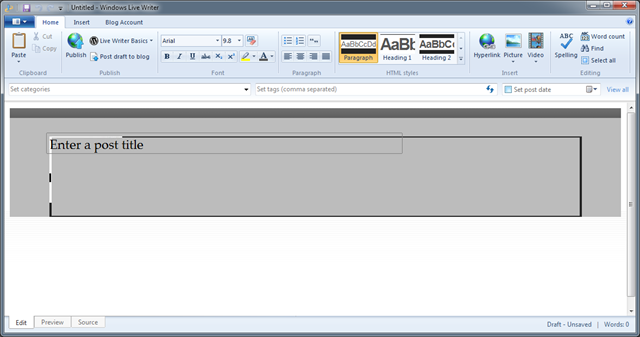 Here is how the Live Writer editor window looks with the freshly downloaded theme (Blog Account tab > Update theme). The post title entry box is partially obscured by the header image as is part of the main text area. This is particularly troublesome when the image is the same color as the text – you can’t read your own writing! Here is another example, this time the background image in the actual blog is overlaid with a semitransparent text area. Live Write is confused by this and it shows the background in its full glory. Seeing the entered text is difficult. If you are bothered by such a situation, here is my work-around solution. Now the Live Writer edit window is completely useful and preparing a post is fast, easy, and convenient. The modified local image files will not affect the blog, you see these images only in Live Writer. 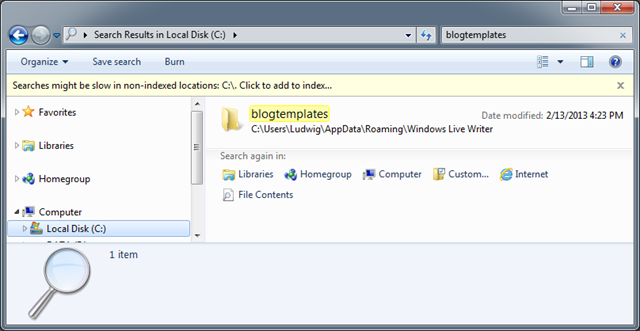 The first step is to locate the folder “blogtemplates”. The easiest way is to open Windows Explorer (File Explorer in Windows 8). Then click Local Disk under Computer in the navigation pane (If you renamed your main dirve look for that name. It is usually your C: drive). 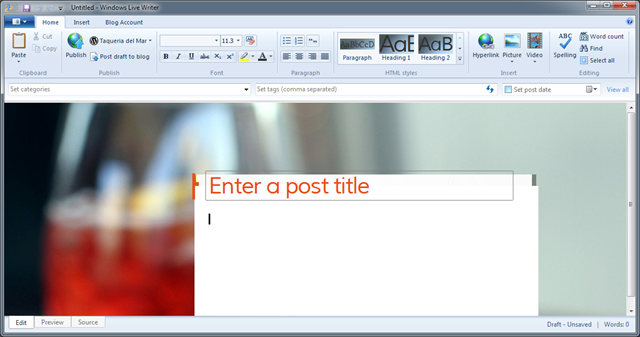 In the search box enter blogtemplates. The folder will be found in C:\User\yourname\AppData\Roaming\Windows Live Writer. Of course, you can step through the folders and get there that way. You can load the header or background image into Paint and there draw a light-colored rectangle over the area where text entry will take place. My approach was to get the correct width by doing a screen capture of the open blog in a browser and then clipping out a bit of the text area and pasting it to the appropriate location in Paint. Note of caution: Both subfolders in the theme folder in blogtemplates will have the header and background images. If you make the changes in the wrong one, you will not see the correction in Live Writer. I have not explored the reason for two subfolders and how the contents is used. If you mess up royally just update the theme to get new files downloaded and start over.